Our tipis are set in an area of outstanding beauty, with plenty or little to do. Chill out around the fire with a bbq or pop accross the road for a slap up meal, the choice is yours. We can assist you in arranging many activities in the field including team building, archery, willow weaving or bushcraft. In addition we're a short distance to some great acticvities which have been enjoyed by Stag parties, Hen parties, birthday bashes, team building and just good old get togethers. Just 100m from the tipis and just across the road is The Pelican. "The Peli" as it's known is a real country pub offering drinks all day, lunch and dinner and most often live music on the weekends. 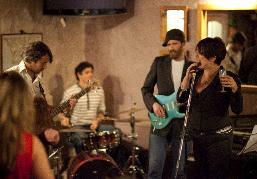 In the past Tipi Wales guest have been entertained by the likes ofCharlotte Church & Sian Evans. Just 1 mile away are Ogmore and Southerndown which are great for surfing. Go it alone or get some professional lessons by fully qualified instructors at Southerndown or one of Ogmore-by-Sea's many beaches. 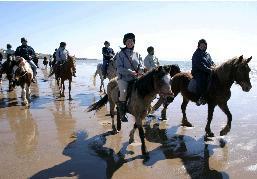 Riding a horse on a wide open beach near the lapping fringe of the sea is a dream for many people. At Ogmore Farm next to the Tipis in South Wales this dream is a reality, every day. Either join one of the treks, or more experienced riders can rent a horse and go it alone. This well developed coasteering outdoor activity sees us in wetsuits traversing at sea level and making full use of the sea cliffs. Very popular Stag and Hen activity. 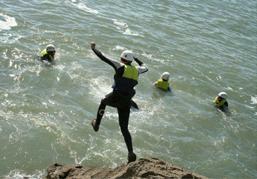 involving swimming and jumping from height into the sea all fully equipped and supervised. There are several options for fishing around the tipis, the river a stones throw away for trout, sewen and grey mullet (club permit & rod licence req'd). 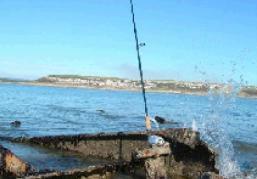 Alternatively a short walk to the tidal water of the river and it's mouth where you can freely fish for mullet, bass and other sea fish.